F. J. Duarte, Multiple-prism grating designs tune diode lasers, Laser Focus World 29 (2), 103-109 (1993). Closed-cavity multiple-prism near grazing-incidence grating configuration for tunable semiconductor lasers as described in the 1993 Laser Focus World article. Closed-cavity configurations offer lower noise and enhanced protection from unwanted external optical feedback. P. Zorabedian, Characteristics of a grating-external-cavity semiconductor laser containing intracavity prism beam expanders, J. Lightwave Tech. 10, 330-335 (1992). This paper demonstrates linewidths of 100 kHz, tunable in the 1255-1335 nm range, using multiple-prism grating configurations. C. Voumard, External cavity controlled 32 MHz narrowband CW GaAlAs-diode lasers, Opt. Lett. 1, 61-63 (1977). M. W. Fleming and A. Mooradian, Spectral characteristics of external-cavity controlled semiconductor lasers, IEEE J. Quantum Electron. QE-17, 44-59 (1981). E. M. Belenov et al., Methods of narrowing the emission line of an injection laser, Sov. J. Quantum Electron. 13, 792-798 (1983). It is interesting to note that these early papers described tunable diode lasers with closed-cavity configurations. These references are listed in F. J. Duarte, Tunable Laser Optics, (Elsevier-Academic, New York, 2003) Chapter 7. 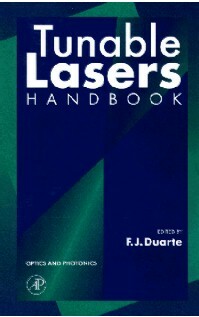 F. J. Duarte, Dispersive external cavity semiconductor lasers, in Tunable Laser Applications, F. J. Duarte (Ed.) (Marcel Dekker, New York, 1995) Chapter 3. F. J. Duarte, Narrow-linewidth laser oscillators and intracavity dispersion, in Tunable Lasers Handbook, F. J. Duarte (Ed.) (Academic, New York, 1995) Chapter 2. 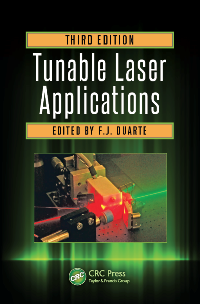 P. Zorabedian, Tunable external cavity semiconductor lasers, in Tunable Lasers Handbook, F. J. Duarte (Ed.) (Academic, New York, 1995) Chapter 8. R. W. Fox, L. Hollberg, and A. S. Zibrov, Semiconductor diode lasers, in Atomic, Molecular, and Optical Physics: Electromagnetic Radiation, F. B. Dunning and R. G. Hulet (Eds.) (Academic, New York, 1997) Chapter 4. F. J. Duarte, Broadly-tunable dispersive external cavity semiconductor lasers, in Tunable Laser Applications, 2nd Ed., F. J. Duarte (Ed.) (CRC, New York, 2009) Chapter 5. F. J. Duarte, Quantum Optics for Engineers (CRC, New York, 2014) Chapter 3 and Appendix A. .
F. J. Duarte, Tunable Laser Optics (CRC, New York, 2015) Chapters 7 and 9. F. J. Duarte, Broadly-tunable dispersive external cavity semiconductor lasers, in Tunable Laser Applications, 3rd Ed., F. J. Duarte (Ed.) (CRC, New York, 2016) Chapter 5. J. D. Berger et al., External cavity diode lasers tuned with silicon MEMS, IEEE LEOS Newslett. 15 (5), 9-10 (2001). D. Anthon et al., External cavity diode lasers tuned with silicom MEMS, in Technical Digest Optical Fiber Communications Conference (Optical Society of America, Washington, DC, 2002) Paper TuO7. J. D. Berger et al., External cavity diode lasers tuned with silicon MEMS, Semiconductor International (2002). J. D. Berger and D. Anthon, Tunable MEMS devices for optical networks, Optics and Photonics News 14 (3), 42-49 (2003). A. Q. Liu and X. M. Zhang, A review of MEMS external-cavity tunable lasers, J. Micromech. Microeng. 17, R1-R13 (2007). F. J. Duarte, Broadly-tunable dispersive external cavity semiconductor lasers, in Tunable Laser Applications, 2nd Ed., F. J. Duarte (Ed.) (CRC, New York, 2009) Chapter 5 (Section 5.3.6 is entitled Tuning Miniature MEMS-Driven Cavities and focuses on synchronous tuning techniques and tuning based on nanometer changes in the cavity length). M. J. Weida et al., External-cavity QCLs broaden capabilities for molecular detection, Laser Focus World 46 (4), 58-62 (2010). F. J. Duarte, Quantum Optics for Engineers (CRC, New York, 2014) Chapter 3. .
F. J. Duarte, Tunable Laser Optics (CRC, New York, 2015) Chapter 7. A. Hugi et al., External cavity quantum cascade laser, Semicond. Sci. Technol. 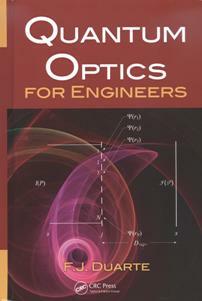 25, 083001 (2010)..
F. J. Duarte, Quantum Optics for Engineers (CRC, New York, 2014) Appendix A. .
F. J. Duarte, Tunable Laser Optics (CRC, New York, 2015) Chapter 9. L. Y. Pang, J. G. Fujimoto, and E. S. Kintzer, Ultrashort-pulse generation from high-power diode arrays by using intracavity optical nonlinearities, Opt. Lett. 17, 1599-1601 (1992). P. J. Delfyett, L. Florez, N. Stoffel, T. Gmitter, N. Andreadakis, G. Alphonse, and W. Ceislik, 200 fs optical pulse generation and intracavity pulse evolution in a hybrid mode-locked semiconductor diode-laser/amplifier system, Opt. Lett. 17, 670�672 (1992). R. A. Salvatore, T. Schrans, and A. Yariv, Wavelength tunable source of subpicosecond pulses from CW passively mode-locked two-section multiple-quantum-well laser, IEEE Photo. Tech. Lett. 5, 756�758 (1993). F. J. Duarte, Broadly-tunable dispersive external cavity semiconductor lasers, in Tunable Laser Applications, 2nd Ed., F. J. Duarte (Ed.) (CRC, New York, 2009) Chapter 5. (Section 5.5 includes a short review of cavity configurations and a table describing the performance of various designs). I. E. Olivares, A. E. Duarte, T. Lokajczyk, A. Dinklage, and F. J. Duarte, Doppler- free spectroscopy and collisional studies with tunable diode lasers of lithium isotopes in a heat pipe oven, J. Opt. Soc. Am. B 15, 1932-1939 (1998). I. E. Olivares, A. E. Duarte, E. A. Saravia, and F. J. Duarte, Lithium isotope separation with tunable diode lasers, Appl. Opt. 41, 2973-2977 (2002). W. DeGraffenreid and C. J. Sansonetti, 2 2S1/2 - 4 2S1/2 transition of atomic lithium by Doppler-free two-photon spectroscopy, Phys. Rev. A 67, 012509 (2003). H. Park, D. H. Kwon, and Y. Rhee, High-resolution spectroscopy of Sm I performed with an extended-cavity diode laser, J. Opt. Soc. Am. B 21, 1250-1254 (2004). 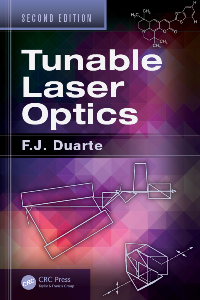 I. E. Olivares, Lithum spectroscopy using tunable diode lasers, in Tunable Laser Applications, 2nd Ed., F. J. Duarte (Ed.) (CRC, New York, 2009) Chapter 11. Page published on the 19th of February, 2005. Updated on the 20th of January, 2016.